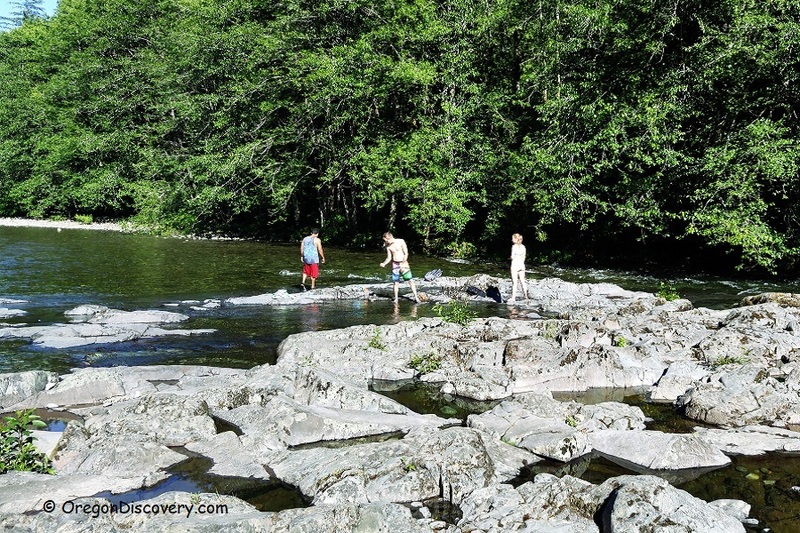 Salmon Falls County Park is located roughly 36 miles east of Salem. 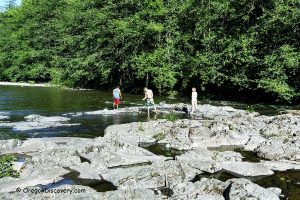 The forested area (22.62 acres) with minimum development on the Little North Fork of the Santiam River is a popular destination on a hot summer day. The feature of the Salmon Falls County Park is a nearly vertical cliff wall across the river with a waterfall. The cliff wall is about 30 feet high and 250 feet wide. The water is deeper along the cliff wall below the waterfalls. The area above the falls is shallow and good for wading. Islands of flat ledges are perfect spots for sunbathing. A fish ladder was built into the cliff wall to help salmon bypass the falls. The bank consists of large pebbles and small boulders. There are picnic tables and hiking trails. 105 miles northwest of Bend. Drive approximately 24 miles east on State Highway 22 from Salem to N Fork Road/Little North Fork, turn left onto North Fork Road, and continue 14 miles to your destination on the right. From 2017 visitors of Marion County Parks must pay a parking fee of $5 per day per vehicle or purchase a $30 annual parking pass.